The Saint Felix is a fancy joint on Cahuenga in Hollywood with high ceilings, ornate chandeliers, heavy oaken tables, and circular booths in cozy alcoves. The waitresses are pretty actresses who wear tight-fitting or plunging-neckline black. They serve the drinks slow but make good flirts. The bartender you could swear was in a print campaign for the new iPhone. He sports perfectly trimmed stubble. All around are tailored jackets and stylish scarves, tapered jeans and dark shirts that really make a straight white smile pop. I had been to the Saint Felix once before on my sister’s birthday a little over a year ago. 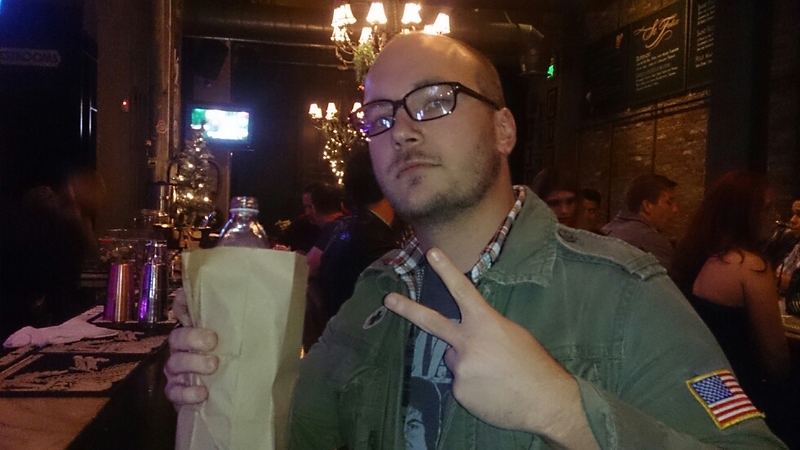 That night I ordered, among other things, a tall Colt 45 served in a brown paper bag. The same malt liquor I once gulped down in the wake of a breakup, lounged in a dirty patio chair at the back of my apartment ten feet from the dumpster. Saint Felix took the drink and redefined it as an accessory, a statement. After some math regarding ounces, alcohol content, supposed cost, and a possible lack of conversation topics–I decided that I would be the guy who was drinking from a bag in middle of a gastropub. Besides, I was wearing a Dickie’s hooded coat. As any sensible actor would tell you, the costume defines the character. Again I am at Saint Felix for a birthday, this time for a friend and coworker. The jacket hanging over my shoulders tonight, faded green with a military cut, suggests an origin more honorable than the Target clearance rack that once held it. In so much propriety, through that sea of image, it urged me on to embrace my own contrarian nature. So I order another bagged Colt 45 from the bartender, a tall and thin blonde woman with a polite smile. A stray elbow catches me in my left side. It belongs to a glossy-eyed redbeard white guy in a beanie. His latino buddy with the shaved head and wire frame glasses holds up a camera phone. “Was there anything inside the bottle?” Neither picked up on my lame joke. “Nah, man. It had this. Rosé. You wanna try it?” The guy with fog in his eyes pinches the stem of his champagne flute, filled with bubbling purple red. “Are you serious? Because I will. You just have to have some of mine too.” I slide over my forty and take his glass. I’m not OG. I’m not even New G.
The dregs of the forty are warm and flat, but I drink it up anyways. It doesn’t take much to flag down the friendly bartender and ask her to close out my tab. She returns with the bill wallet, almost smirking. Flipping it open I can see why. I thought $125 was expensive for champagne. It is. Similarly, $15 is steep as hell for something you can get at 7-11 for a couple of bucks. And I’ve ordered this twice?